Kampala – Hassan Mubiru was a great Ugandan Footballer who shinned in the late 90’s and Early 2,000’s while playing for SC Villa, Express football club and the Uganda Cranes. Over the Weekend, Kabira Country Club Organized their First Football Tournament that is aimed at promoting fitness and close cooperation among corporate companies. The Event was organised under the A6 aside system to enable very many companies to participate. It started at 10am till 5pm with companies such as Bet Yetu, Kabira Country Club, Victoria University, Riham group of Companies, Prozone ,Yo Kuku ,Cipla, Alpha Bet and many others all taking part. Prozone comprised of legends including Hassan Mubiru, Hakim Magumba, Nestroy Kizito, Abdallah Mubiru, Hon Mohammed Nsereko, Mugibu Kasule and Herbert Nsubuga who was known as “Masanda”. 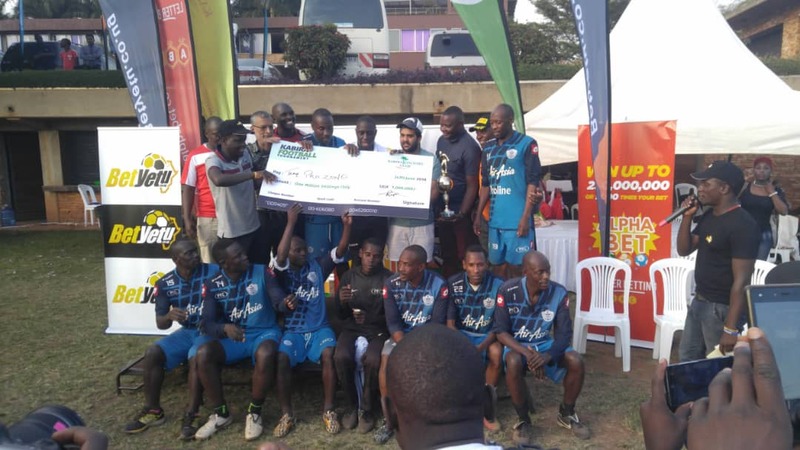 Prozone Soccer team won the tournament, defeating Victoria University 1-0 in the final and in the process taking the a grand Prize of 1Million Shillings. Victoria University walked away with Ugx 500,000 for taking the Runner’s up spot. Hassan Mubiru was voted the Most Valuable Player. Mr. Rajeev Ruparelia the Director of Kabira Country Club appreciated various teams for Taking part in the Tournament and assured them that it with be a quarterly Tournament that all companies should embrace. Mr Keith Hathaway the head of Consumer Marketing @Bet Yetu pledged to work closely with the event’s organisers and promised to Pump in more money to Support the Tournament. “We will work closely with the organizers so as we grow the tournament, said Hathway. “I also promise to increase the investment in terms of money for the up-coming events.